The Wet Tropics World Heritage listed rainforest near Kuranda is home to thousands of plant and animal species. This is one of the most diverse plant communities on Earth. For example, there are over 1000 species of trees recorded from the Far North Queensland tropical rainforest. Compare this with the 35 tree species listed as native to the British Isles. New species continue to be found. It was once thought that Australia’s rainforests were late arrivals from Asia, spreading here via Indonesia and Papua New Guinea at a time when the sea level was lower and land links allowed their spread. It is now known that the Australian rainforest is very old, containing a disproportionate number of the so-called primitive species. Only nineteen families of plants world wide are considered primitive. Thirteen of these are represented in North Queensland and two are not found elsewhere. The vine Austrobaileya scandens which grows strange green flowers with purple dotted stamens is found only between Mt Spurgeon and Ravenshoe, and it bears pollen like the earliest known fossil pollen. 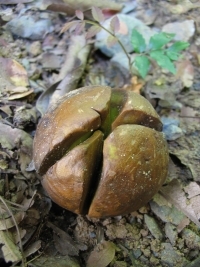 Idiospermum australiense is another of these green dinosaurs, growing strange tennis ball sized fruits poisonous to all known animals and birds. How were these fruit spread? Some people think that a now extinct animal, belonging perhaps to the megafauna that died out about the time of Aboriginal occupation, may have been immune to the poison and therefore spread the fruit. All other plants on Earth produce seeds composed of one or two seed leaves or cotyledons. Grasses, pines and bamboos have one seed leaf. Most broad leaved plants have two (the familiar halves of the peanuts we eat). 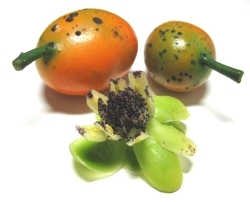 Yet the Idiot Fruit produces three or four seed leaves, and can produce multiple shoots per seed, something again unique. Even more vulnerable than the rainforest is the thin corridor of wet schlerophyll forest which flanks the rainforest. It is home to magnificent Rose Gums Eucalyptus grandis and is a rich ecosystem for birds and small animals such as the endangered Northern Bettong. It is likely that burning played a part in preserving the more open undergrowth of these forests, though it may be that severe droughts or frosts may have been the most critical agents controlling the spread of rainforest into these open forests. We still have much to learn about how to manage these small but valuable ecosystems. Rainforest species have been preserved over many millions of years in refugia, islands of rainforest mostly on mountain peaks, during periods when the earth was drier and the rainforest retreated to the few moist areas remaining. Volcanic activity, which produced the rich soils of the Atherton Tablelands also destroyed large areas of rainforest in the past. Far North Queensland is rich in these refugia, such as Black Mountain and Lamb's Head in the Kuranda area. The Envirolink Corridor includes remnant rainforest, regenerating rainforest, and wet schlerophyll forest along its western margins (see Map). These contain a number of rare and endangered plant species. About half of all the plants tested in rainforest contain alkaloids and other chemicals with potential medicinal value. The old attitudes towards clearing the 'scrub', as rainforest was disparagingly known, are beginning to change. We are beginning to recognise the value of rainforest as a source of future medicines, as a source of clean water (rainforest scoops huge quantities of water from the clouds on mountain peaks), and as a wilderness experience that is becoming increasingly rare in other parts of the world. Tourism based on natural values is now a dominant industry in our region. Sadly urban development is still encroaching on unprotected forest which remains in the Wet Tropics bioregion. Poor planning is perhaps the greatest threat to biodiversity in the Kuranda area, as in many other places. Kuranda Envirocare is working to preserve existing vegetation communities saving years of volunteer hours and costs to replant.